Even longer, seems to be the hours I need to let the custard chill in the fridge, before I can actually get to the ice cream making with my new attachment. Le Sigh. Perhaps I'll just show you the steps involved before the ice cream making can begin. So before the frozen bowl can even come out of the freezer, there are some things that need to be done. First, milk, cream, sugar and vanilla need to be heated on the stovetop. Boom! I did it! Look at all that vanilla and the pod just hanging out. I am always amazed at just how many seeds can be scraped out of a vanilla pod. My first stint at waiting is going to be the half hour I need to let all this goodness steep. But in that time, I can ready my 6 egg yolks and pour out my other cup of cream. Next, I (slowly) pour the warmed, steeped mixture into the eggs. Slowly, so as not to cook my eggs. Scrambled eggs ice cream anyone? No? Fine! Slowly I will proceed. This mixture is then poured back into the pot and put back on the heat. It needs to be stirred constantly so as not to stick to the bottom of the pot. It is ready to be removed from the heat, once it has thickened. which can now be chilled in an ice bath. I just filled the sink with ice and water, which I think does the trick nicely. I forgot to mention that I need to first pour the custard through a fine mesh sieve before incorporating it into the rest of the cream. I only have this ridiculously small sieve for this job. Honestly people, could we start a telethon to get me a regular sized fine mesh sieve?? I'm not gonna lie, this took a long time to pour through this sieve. 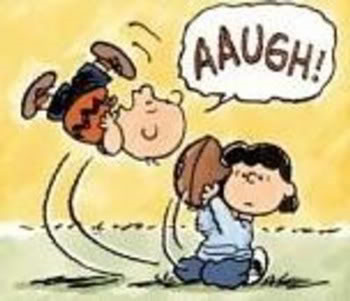 Tears (of impatience) were shed and a few Charlie Brown, "aaughs" were uttered. This sieve is my Lucy. But I did it. And here is the finished product (missing the 3/4 tsp of vanilla that I was supposed to add.....hopefully the whole vanilla pod was enough for flavour.) A lovely custard that now needs to cool in the fridge for hours. I've decided to move it to the freezer to try and speed up the process. (shh) And we're totally going to gloss over the fact that I forgot the extra vanilla.....fully reading a recipe is also my Lucy. Aaugh!!!! Quinoa salad with cucumbers, red peppers, drizzle of olive oil and a splash of lemon. And to all that, I added some kale that I had previously sauted with a little olive oil and red chili peppers. Mmm Mmm. We had this for lunch with some feta cheese crumbled on top. It was delish! I also made some Chickpea Crunchies. Honestly, the easiest thing to make ever. Just need to rinse a can of chickpeas with cold water and then pat dry. Next, a few spices and 2 tsps. of olive oil get tossed with the chickpeas (I used fennel, cayenne, red pepper flakes, salt and pepper) and then layered onto a baking sheet and baked at 400 degrees for half an hour. And we've got a crispy crunchy snack that is high in protein, low in fat. Boo-Ya! Okay, the custard has spent a sufficient amount of time in the freezer. It is now chilled enough to put in the ice cream bowl. Woot-Woot!!! Ta-Da! I did it! And all by myself! Proud? Yes. Relieved? Oh, yes! 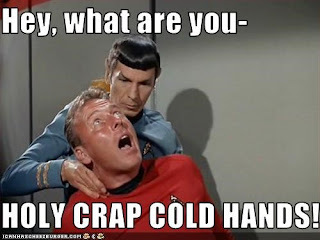 Hands frozen from holding the bowl and trying to fit it onto the kitchenaid? I'm sorry, what was the question? Twenty minutes later (at a low speed) the custard turned into this. Just going to pop this into the freezer to chill (again). And now I'd like to introduce Mr. Scoop to the Ice Cream. Hubbie had the ice cream with cantaloupe and thought it was yummy. Thanks honey. So there we have it; my first foray into the world of ice cream making. 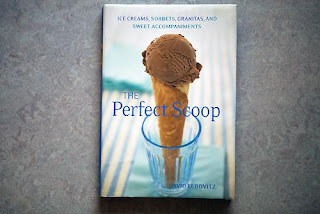 I used the Vanilla Ice Cream recipe from David Lebovitz's Perfect Scoop. I can't wait to try other recipes in the book! Looks delish! And I think I'm gonna have to try the chikpea crunchies today!